As early as 2003 the Jericho Forum was created to tackle "de-perimeterisation" and later in 2014 Google released their "BeyondCorp" paper detailing how they made it happen. However, have Zero-Trust security models been adopted in the enterprise and what challenges do organisations face when considering de-perimeterisation? 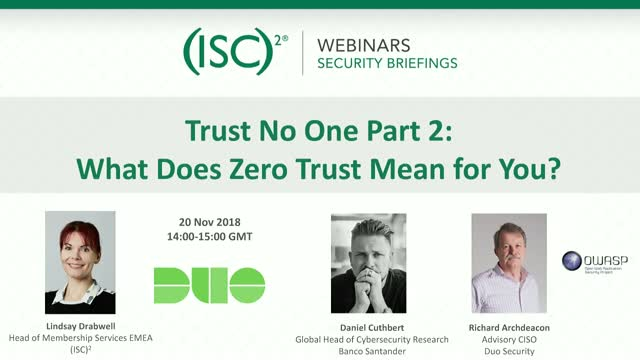 Join the discussion between Richard Archdeacon from Duo Security and Daniel Cuthbert from Banco Santander in Part 2 of the Zero Trust series and learn about Zero Trust deployments within the enterprise. Title: Trust No One Part 2. What Does Zero Trust Mean for You?